Before even commencing work on this timepiece, the technicians and watchmakers at BOVET 1822 and DIMIER 1738 Manufacture began by ‘forgetting’ their certainties and habits in order to deliver a more intuitive and innovative way of reading the time articulated around the two stars that define it: the earth and the moon. As well as understanding the various astral phenomena related to the measurement of time, this newfound perspective also enables us to tell the time in all regions of the globe simultaneously. And it was precisely this broader universal vision that governed the development of this timepiece. Seen from space, the spherical shape of the Earth enables us to observe only half of the surface at a time. Thus was born the idea of representing the entire globe in a single hemisphere. A cartographer was specially commissioned to design this atypical and hitherto unknown 3D map of the world. Thanks to this ingenious solution, the Earth’s surface can be seen in its entirety, without changing point of view. A first hemisphere was thus chosen to represent the Earth and enable the reading of universal time, which is displayed in three dimensions at 3 o’clock. A hand affixed to the North Pole—that is the axis of our hemisphere—follows its curve. It can be assigned to any one of the 24 time zones selected by the user. At its tip, a concentric ring displays the time in the chosen time zone, while the name of the city corresponding to that time zone appears on one of the two concentric rollers indexed to the hemisphere. The time zone hand is another first. Never before had the manufacturer produced a hemispheric hand, with all the difficulties inherent in the high quality required. In addition to displaying the time and the name of the city corresponding to an easily adjustable time zone, the 24-hour ring that surrounds the globe enables instant reading of the time anywhere in the world. Simply follow a straight line from the center of the globe, passing through the selected geographical point. The tip of this line will point to the exact time in the selected place on the graduated ring. To link the hand of the second time zone to a specific city, simply press the center of the crown. With each successive press, the needle jumps by an angular value of 15°, representing the exact value of the time zone. This action also activates the rollers and the names of the cities corresponding to the time zones indicated by the hand are displayed in sequence. The choice of two concentric rollers to indicate the cities offers the two-fold advantage of taking up little space whilst providing exemplary readability. The mechanism that drives them required great ingenuity. The outer roller displays 11 cities simultaneously, then makes way for a window, which opens an aperture to the second roller—arranged concentrically inside the first roller—and displaying the 12th city. This inner roller then turns in order to display the 13 subsequent cities in the aperture. The whole system is controlled by a column wheel. The system, which is easy to use and to read, also required great ingenuity and demands extremely precise adjustments. The tension of each spring is perfectly calibrated for a flawless, reliable operation. To protect these settings and the entire mechanism, a ‘constant force’ correction was devised for which a patent was filed. When the user activates the corrector, the pressure of their finger can vary substantially from individual to individual. With a traditional system, the entire correction mechanism absorbs the pressure applied. But in the new correction system, the correction is transmitted to the mechanism when the user releases the pressure. It is thus the spring-loaded correction that transmits a measured and constant energy to the entire mechanism. This is in turn protected from excess pressure, for optimal adjustment and reliability in the long-term. The cylindrical form and engraving of the city names make for a particularly exquisite decoration. And to enhance their readability still further, the rollers are treated in black rhodium while the engraved names of the cities are lacquered in white. A single hemisphere is therefore sufficient to simultaneously display the exact time anywhere in the world. This information and its representation make it one of the most useful complications in existence. This new perspective on the Earth and universal time also enables the moon to be observed. So it seemed self evident to complement universal time with a moon phase indicator, and entirely consistent to represent the moon correspondingly, in the form of a hemisphere. Two circular apertures follow the curve of this lunar globe and indicate the age of the moon as seen from the northern and southern hemispheres respectively. The moon and the starry sky succeed each other in both windows and, although unusual, this representation of the time is both realistic and intuitive. The moon phase indicator is of course driven by a highly precise mechanism that only requires correction by one day every 122 years. 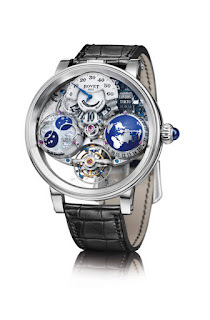 The hemispherical representation of universal time and that of the moon phases requires a particular construction in order to meet the qualitative and aesthetic norms that are the hallmarks of BOVET 1822. Each hemisphere is therefore machined in a single piece and their surfaces engraved with the correct relief. The oceans are then filled with luminescent blue material. The craters on the moon are all in white luminous material while the sky and space glow a deep blue in the darkness. A common solution was found for both these constraints. On the one hand, these hemispheres had to move freely and with optimal performance, so as not to influence the impeccable chronometry of the timepiece. On the other hand, the watchmakers wanted to avoid the use of a pivot around the central axis for esthetic reasons, as well as the need to extricate the pivot from the time zone hand at the Earth’s Pole. The original and patented mechanism devised to meet these constraints is composed of three adjustable ruby runners arranged around the exterior of the hemispheres. Enthusiasts will no doubt appreciate and even feel the incredible results of this system. These two hemispheres occupy the space at 3 o’clock for universal time and at 9 o’clock for the moon phase indicator. Logically enough, the watchmakers used the space at 12 o’clock to display the hours and minutes and the power reserve. They once again returned to their unusual viewing angle to devise an indicator as natural and intuitive as the one referred to earlier. Several strata were superimposed to evoke a third hemisphere dominating the first two with all the symmetry and balance that is so dear to the House. As near to the mainplate as possible, a flat sapphire disc displays the hours, which are revealed when positioned on a lacquered plate. This digital display makes for easy and immediate reading of the time. In the center of the display, a curved dial displays the exceptional five-day power reserve. A third stratum dominates this ensemble. This section indicates the minutes by means of a retrograde hand. The combination of jumping hours and retrograde minutes raises the technical problem of the synchronization of instantaneous jumps—a complication perfectly mastered inhouse and which has already met with resounding success in other timepieces in the collection. As usual, the dials were manufactured in-house. The craftsmen at BOVET 1822 demonstrate the full extent of their talent in the dials of this Shooting Star®. The juxtaposed surfaces of the curved dials result in a perfect surface, whether in white or in aventurine! The Shooting Star® Tourbillon is perfectly designed for travel because the corrector enables the hour disk to be adjusted without affecting the minutes, seconds, universal time or indexed time zone. The pushpiece is simply pressed and the watch is easily readjusted to the latest time zone being visited. To drive all of the complications, the two barrels generate five days of power reserve, all controlled by a tourbillon balance oscillating at 21,600 vph. Three blued masses are positioned on the golden serge, inspired by the shape of the arches that adorned the balances of BOVET pocket watches in the 19th century. The DIMIER escapement and its specific centering guarantee exemplary performance. Of course, like all components used in the manufacture of BOVET movements, the Shooting Star® is regulated by a hair spring manufactured in the in-house workshops— an art mastered by fewer than ten watchmaking companies around the world. Performing each of its revolutions in one minute, the tourbillon features a triple seconds-hand, unusually placed under the tourbillon and following a subtly tampoprinted graduation inside the crystal, for a clear and original display. The decoration of the movement of this Shooting Star® Tourbillon perfectly matches its originality, technical complexity and innovations. 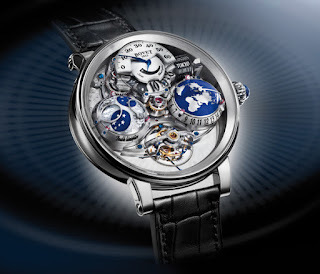 An entirely hand-engraved constellation of stars extends across the entire surface of the movement. Like many other symbols, a moon phase is entirely represented on the back, with captivating poetry. On the same side, two entirely hand-engraved hemispheres evoke the spherical nature of the terrestrial and lunar globes. The carriage and tourbillon bridges are also entirely hand-engraved, despite their delicate nature and the tiny amount of surface area available. The technical intricacy of this spatial vision of time inspired the technicians and watchmakers at BOVET 1882 and its DIMIER 1738 Manufacture to devise a movement based on resolutely innovative methods, which led to the filing of two patents. This approach led to a totally original and modern architecture that remains firmly rooted in the values and demands of craftsmanship and high watchmaking that are the essence of BOVET. Thus, the incline that describes the movement between the top of the minutes dial and the tourbillon, and the use of the hemispheres, naturally necessitated a new direction for the design of the case which is completely consistent with the vision of this timepiece. A domed sapphire crystal with a very pronounced curve therefore crowns the case of this Shooting Star® Tourbillon. But the designers did not stop there. To open the world of this timepiece to the infinite, the watch middle follows a pronounced oblique incline along the 12 o’clock to 6 o’clock axis. The hours disk corrector is positioned at 12 o’clock, for a supremely ergonomic display and positioning that confirm the symmetry of the watch. The presence of a total of seven domes, including the four hemispheres of the movement, the dials, the tourbillon carriage and the upper crystal lend the ultimate finishing touch to this timepiece. Before the Récital 18 Shooting Star® Tourbillon, the notion of infinity was defined by two closely related concepts alone: space and time. To these we must now add the passion of Pascal Raffy and the craftsmen of the House of BOVET, which has once again proved that it has no limits.